As the peak of hunting season is fast approaching many people are doing the final tweaks to their gear and equipment. If cranking up your draw weight was something you had in mind, you may want to rethink your decision. I'm all about putting a little speed behind that arrow but you want to be careful you don't take it too far. In the summer you usually have jeans and a t-shirt on when shooting so drawing is easy. Once you layer up for that below freezing weathering drawing can be an extremely different experience. Bulky clothes can cause difficulty drawing and can leave you stranded on stand if you're draw weight is too high. You may also loose that smooth draw motion with a heavier weight causing a lot of movement therefore increasing your odds of spooking game. A heavy draw weight in a ground blind can cause problems as well. If you need to arch your bow in anyway when you draw this could be a disaster in a blind. Imagine having a beautiful buck at 20-yards from your blind as you struggle to draw and raise your bow the top limb hits the window spooking him away. Now that added speed only hurt you since you now have nothing to shoot at. A good way to find your perfect draw weight can be at the range. Try shooting with your big coat on or sitting in a chair and drawing with your feet off the ground. If you can still easily draw, your weight should be in check. I also like to practice shooting from a sitting position on a chair, kneeling, and even sitting on the ground. The reason for this is simple. You always want to be prepared for the most awkward shot in case you get caught off guard and can't get to your normal standing position. This way you'll have the confidence to make the shot, and your draw weight will be light enough to make any shot count. Get the top Petersen's Hunting stories delivered right to your inbox every week. GET THE MAGAZINE Subscribe & Save. 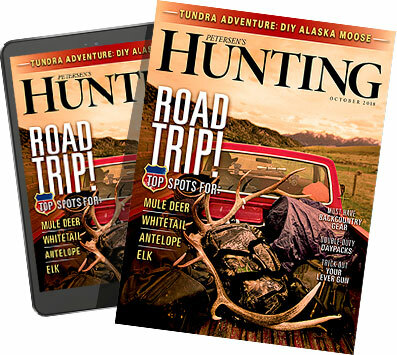 Get the top Petersen's Hunting stories delivered right to your inbox.